In my effort to get better organised I realised that I often have a collection of sketches that live in my sketch book as half baked ideas or doodles that never come to fruition and I was trying to think of ways of using them, suddenly the penny dropped.... Embroidery patterns! 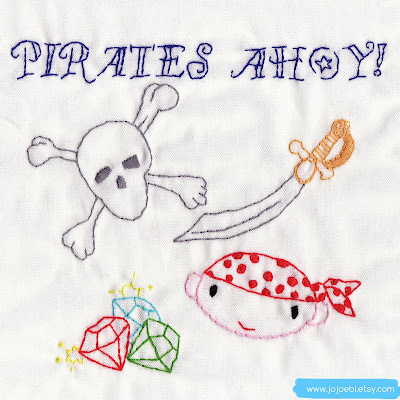 So, with keeping in with the pirates and treasure theme that we have had going all month, here is my first PDF embroidery pattern. There are 30 images and I have reversed them too so you can use them as you like, I have also included a page on how to transfer the patterns. Available right now, in the shop. 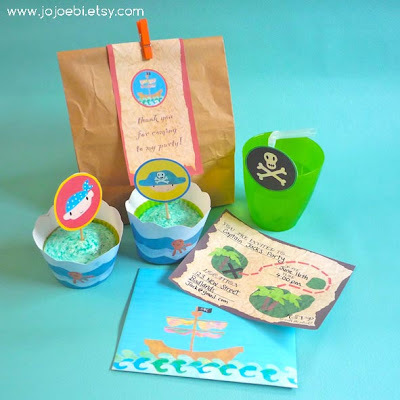 I have just added the Pirate party Pack to the shop so I am throwing one of those in too! If you would like to get your mitts on a copy of both then leave a comment below telling me what your pirate name would be! You must include a contact email address, no email - no win. 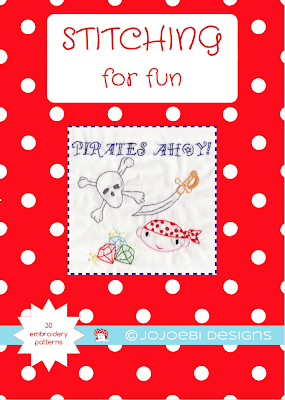 The pattern and Party Pack are PDF files which will be emailed to the winner. of course this tickled the pants off a 6 year old! Wow what a lovely prize. Oh my. My daughter's friend is having a pirate birthday party next month, she'd love this! My pirate name would be Captain Blue-Nails, and I'd paint the tip of my hook hand to match the other nails! I did the quiz above and I am: Captain Ethel Vane! My pirate loving four year old's name: "Capt'n Bird Brain"
His 6 yo sister's pirate name: "Skull Shadow"
We love pirates and have had pirate birthdays two years in a row! drop me a line with the email address you want the files sending to. If I was a pirate,I'd be Honor Boat! My little boy says my pirate name is Captain Mega Mummy, his is Captain Coin Hunter and his poor little sister is just shipmate Jelly Guts!! My pirate name would be captain claress with the mostess.